A man limped into Dr. Lily Wu’s office with a history of two prior ankle surgeries . . .
“After the first acupuncture treatment, he was able to go dancing that same night without being bothered much at all by the pain. The next time he came to see me, he was so excited with how much the treatment helped him,” Dr. Wu said. “In about 6 treatments, he only noticed when he did have pain. This was the opposite of how he felt before he started treatment when he was in pain most of the time. After about 10 treatments, he went on a long bike ride and had no ankle pain,” Dr. Wu said. This 53-year old man had an active lifestyle. After he started the treatments, he remained active in all kinds of sports such as skiing, hiking, playing basketball, beach volleyball, soccer, and more. “During this time I also treated him for back pain. He used to have back spasms, but after a number of treatments, the back pain stopped as well,” she said. Dr. Wu earned her Doctorate of Acupuncture and Oriental Medicine. She’s a licensed acupuncturist and Chinese herbalist. 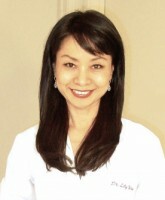 She is on the Palo Alto Medical Foundation doctors’ referral list of qualified acupuncturists. She practices in San Jose, CA. For more information, visit her website at Lily Wu Acupuncture. She is fluent in both English and Mandarin Chinese.